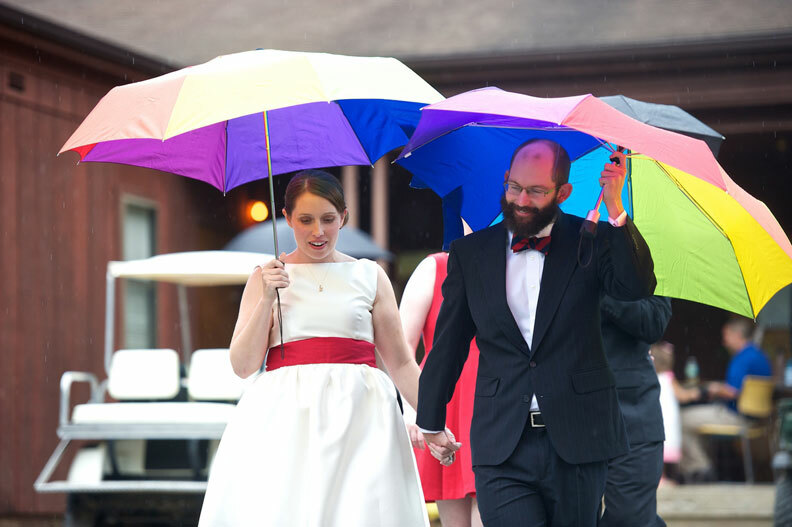 In the almost seven years we’ve been together, Dave and I have had a lot—a lot—of conversations about money. He’s a natural-born saver, while I tend to be more of a spender, but over the years, we’ve managed to merge our two approaches into one that works for us as a couple—we focus on eliminating debt and saving as much as we can while occasionally spending on things that are really important to us (such as travel). 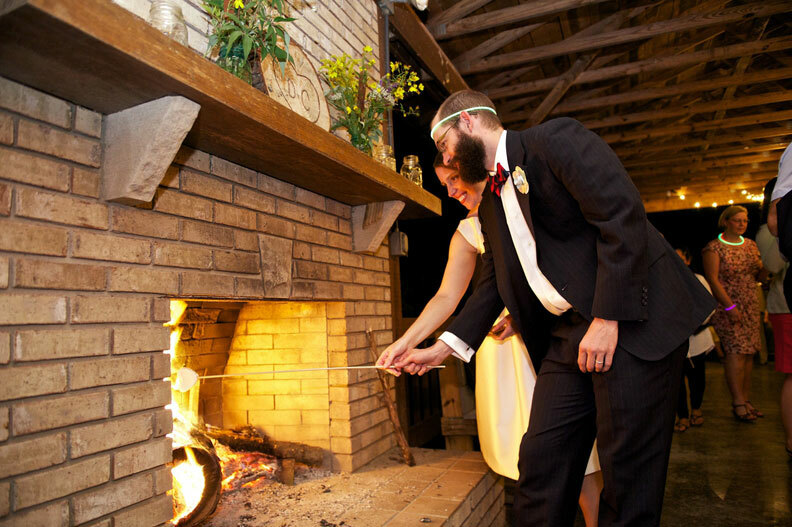 When we got engaged earlier this year and began the six-month process of planning our wedding, we knew we wanted to stick to a pretty strict budget while also making the wedding thoughtful and fun. While we were big fans of this blog and had both read it in its entirety before we even got engaged, we thought $2,000 would probably be impossible given our choice of venue—a summer camp, where we planned to host a weekend-long extravaganza filled with campfires, s’mores, friendship bracelets, and capture the flag. We decided to shoot for somewhere between $5,000 and $10,000, with the goal being to land closer to $5,000. 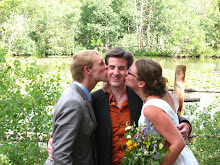 When all the dust had settled, we estimated that we spent around $7,500, including the contributions from our families. Not too bad for feeding and housing 80-something guests for an entire weekend! 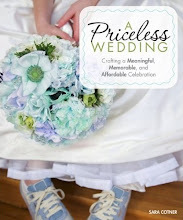 Sticking to a budget meant letting go of a lot of the things that the Wedding Industrial Complex tries to tell you that you need. I decided pretty early on not to have bouquets for the ceremony. Because of the composition of our wedding party (our sisters and their kids on my side; two couples on Dave’s side), everyone was walking down the aisle with someone, so bouquets seemed especially unnecessary. 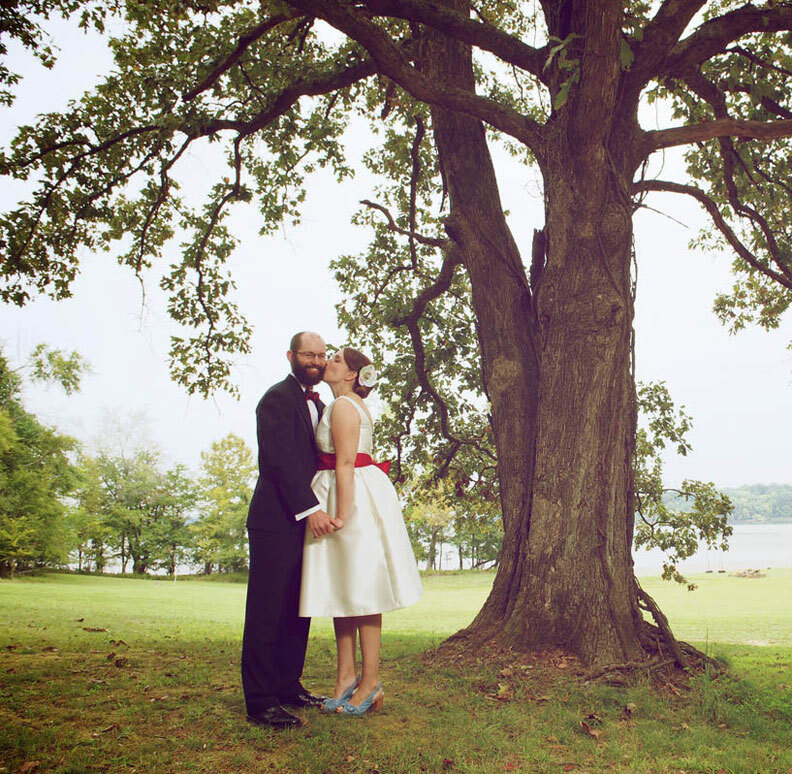 Shortly after we got engaged, I became enchanted with the idea of ordering a custom-made wedding dress from Etsy. At around $800, it seemed reasonably priced compared to the cost of an average wedding dress. And it would be made just for me! But then I thought, “For $800, I could buy a plane ticket to Paris.” It just didn’t seem worth it for a piece of clothing I’d probably never wear again (and that might not even fit properly, considering I’d be ordering it long distance). Instead, I spent $200 on a ModCloth dress that was fancy enough to feel special, but also comfortable and totally my style. Plus, it’s simple enough that I’m hoping I can dye it and wear it again. Our biggest indulgence, and perhaps the most difficult decision we made during the whole process, was hiring a live bluegrass band to play during the reception. My parents found a reasonably priced band through a local college that has a stellar music program, but we were still torn about the decision. On the one hand, we love bluegrass music and thought the live band would create a great atmosphere. But the cost of the band ($500) seemed exorbitant compared to the cost of making our own iTunes playlist and plugging my laptop into the camp’s sound system (free). And what if no one danced to the bluegrass music? Finally, after a week of going over the pros and cons, we bit the bullet and hired the band. I’m so glad we did—it really did create a wonderful atmosphere. People kept saying that they felt like they were in a movie. The dance floor wasn’t packed while the band was playing, but that was OK. 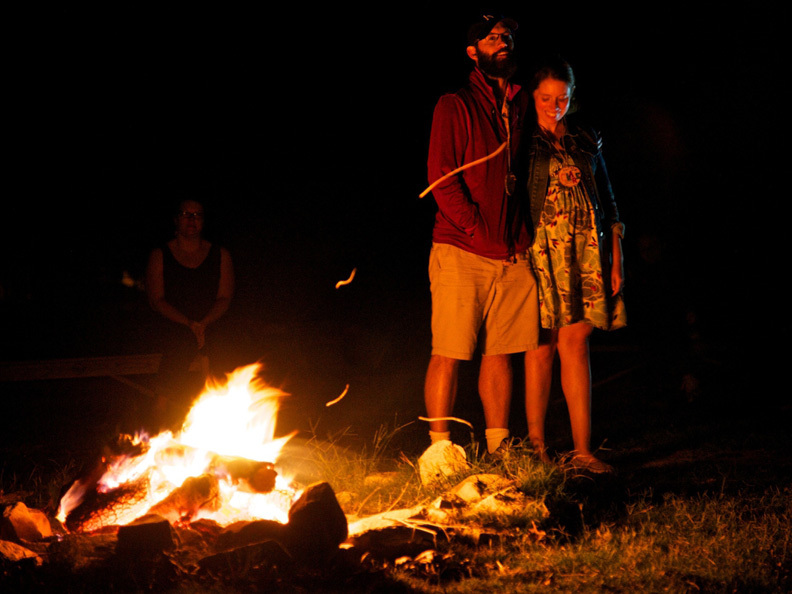 It gave people a chance to mingle, chat, and make s’mores. 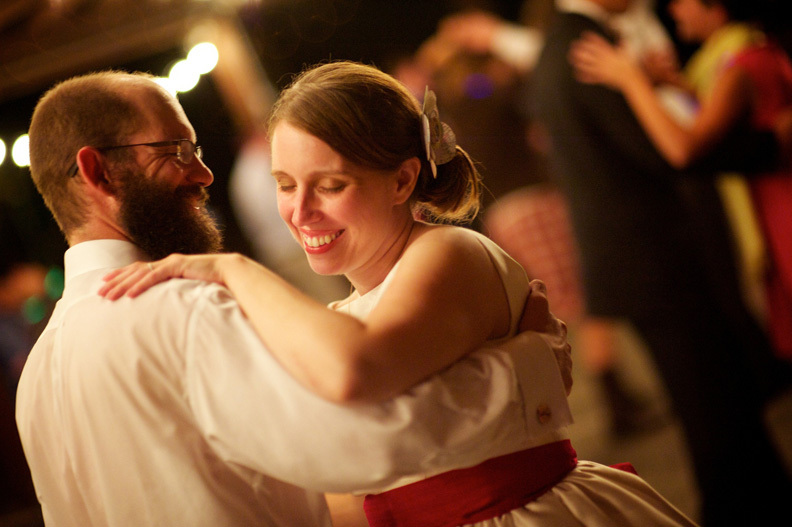 Then, after two hours of bluegrass music, we switched over to our iTunes playlist and the real dance party began! Working our connections went along way toward helping us meet our budget. 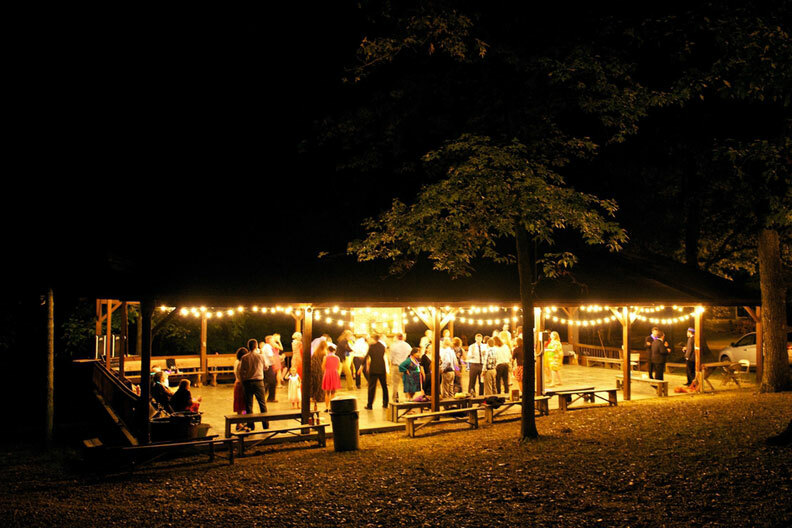 We chose to have the wedding at the church camp where I went every summer as a kid—not only did this make it more personal, but because my dad (a minister) has been so involved with the camp over the years, we were able to pay the discounted lodging rate typically reserved for members of his congregation. We’re also lucky to have some talented friends and family members who helped us out. One of my best friends from college and her husband are the amazing duo behind Pixelate Photography and Design. Kristen designed our invitations and programs for us at cost—we just had to pay for the printing and shipping, which worked out to be about $70 each. We knew that Jason was an awesome photographer (a few months before our wedding, he photographed President Obama at a rally in Cleveland! 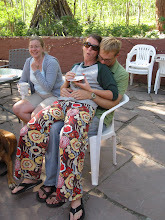 ), so we’d pretty much decided we wanted him to shoot our wedding even before he sweetened the deal by offering us his friends-and-family rate. I also have a couple of friends who make gourmet marshmallows; they gave us a great deal on flavored homemade marshmallows for our s’mores bar. When I mentioned to my dad that I wanted wood nametags for everyone to decorate and wear during our welcome dinner on Friday night, he fired up his power saw and sliced a couple of felled branches into 100 thin wood discs. Between our friends and my parents’ friends, we were able to borrow 75 mason jars to use for decorations, which we filled with Ikea candles and wildflowers that my grandmother picked at an abandoned golf course down the road. We also relied heavily on our friends and family to provide free labor during the weekend—setting up tables and chairs, washing breakfast and lunch dishes, starting campfires, grilling hamburgers and hot dogs. We tried to divide up the tasks so that no one had to spend the entire weekend working (though our parents definitely took on more than their fair share). I tend to be bad at asking others for help, but it turned out I didn’t really have to. So many people came up to us throughout the weekend and asked, “What can I do to help?” We didn’t hesitate to give them a job like Beer Captain or Friendship Bracelet Guru. On our way home, Dave and I discussed what we would have done differently if we’d had an unlimited budget, and I said that I would have hired people to do the grunt work so our friends and family could have relaxed and enjoyed the weekend. But he rather wisely pointed out that the DIY, all-hands-on-deck approach to the wedding was part of what made it so special—sharing the workload helped people forge connections, and seeing all of our friends and family pitch in to get things done made us feel especially loved. I immediately revised my answer—I wouldn’t have changed a thing! Clare M. Alexander is a magazine editor and former rollergirl who spends her free time enthusiastically starting and then halfheartedly sustaining wacky projects like The Saved by the Bell Blog. 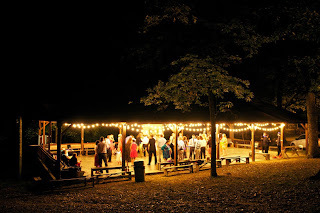 I scrolled down until I saw the pictures because I could have sworn this was a wedding I went to over the weekend - it was a camp wedding (without the capture the flag) and it was fabulous. I think they said it cost about $6000 to rent out the camp, which included lodging for everybody and two breakfasts provided by the camp, plus access to the kitchen. Friends provided the catering and it was delicious, and everybody got a mason jar with their name on it to use for the wedding. We loved staying in the cabins and anyone who didn't want to stay in the cabins stayed at a nearby hotel. Everyone brought their kids and their dogs and had a fantastic time and nothing seemed particularly stressful or exhausting. The camp even had all the tables already set up in the dining room, so we didn't even have to deal with that - just set out sunflowers and were good to go! 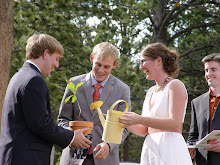 My new conclusion is that camp weddings are awesome and I'm glad you had a nice one. This is so fun! It looks like it was fun and beautiful, and very "you"! This sounds like such a lovely, classy way to do a wedding! I'm normally not a fan of weekend weddings because they can be so expensive to attend, but I am very impressed that you paid for all the guests' lodging along with the wedding party attire. Not many brides do that! It sounds like everyone had a great time and so many people were happy to help you out- probably because you're such a considerate person and naturally your friends and family want to do the same for you. Congrats on your marriage and best wishes for many happy years together!